Occasionally there is a why too, and that why is always because I strive to create something different wherever I can. The photos I’ve taken over the last few years have always been centred around the beer in question. I may use a play on words or some other link to the beer, but either way, the beer always takes the lead, and I’ll fashion a picture around it. It started when Moor Beer hosted Craft Beer Hour and I had a bottle of Confidence, a proper Moor beer, a 660ml bottle. I’d seen plenty of floating cans and I thought, you know what, with this bottle of Confidence I can show just how confident I am and make it float. It did take me while to figure out exactly how I would achieve this, as I didn’t want there to be any sign of anything supporting the bottle in the final photo. But as you can see, the bottle is floating perfectly above the Moor glass. This, like all of my photos was not Photoshopped, I figured out a way of supporting the bottle without any of that support being visible in the final photo. Take a proper look, can you work it out? Since taking this, I explored a little further and came up with the photos that follow. This shot was quite simple; with Seville Row sounding similar to Saville Row, all I had to do was make sure I distributed the one beer I had evenly between multiple glasses which formed a row. Crane Beer, Cake by the Ocean. Around the time that I took this photo, the band DNCE released a song called Cake By The Ocean. I had a bottle of Cake, so a photo of this beer by the sea seemed perfect. Not being a gun owner I thought the best way to photograph this beer was to create a little smoke around it. I’m no longer a smoker but I do vape, and after multiple attempts of vaping around the beer I ended up with something I was happy with. These were the first beers I’d managed to get hold of from Art Brew and all I could think of was the children’s TV program Art Attack, I grew up with this being on TV and now with these beers I could take inspiration from that program and create a beer photo. Verdant/Howling Hops, Auspicious Directions of 8 Mansions. This is where things started to get a little deep, maybe a little too deep for some, but like with my other photos, I wanted to make this a little different. Initially I wasn’t familiar with the concept of the Eight Mansions theory, and a lot of research was required in order to create this shot. The Eight Mansions theory is a practice of Feng Shui used to determine the best and worst locations/positions of your dwelling. It is used to find out whether you are compatible with the house and to find your favourable and unfavourable personal directions within that house. I adapted the rules of the Eight Mansions theory to create my photo and here’s what I ended up with. From the moment I saw this beer, and that artwork, I knew I had to photograph it in front of a pylon. All I had to do was find a suitable location and make the shot. Armed with some suitable support in the form of some steel pipe, I wandered into a farmers field and set about lining up the shot. I positioned the can and glass atop the pipe in front of a pylon and lined up the can artwork with the angular metalwork of the pylon. The final photo was cropped in order to disguise to method of support. Everyone loves a nice lullaby before bedtime, and I’m no different. These were both shot for Craft Beer Hour when Wilde Child hosted. I was lucky enough to have had my name pulled from the hat to receive beer from the hosting brewery, so I thought I’d return the favour and take these. I pushed the boundaries of the floating can shot with this and made it float without using the ring pull. It’s a ganache stout, so rather than putting the beer in the glass, I made some ganache and used that instead. Both the beer and the ganache went down a treat. I know everyone thinks I favour the beers of Brew By Numbers for photo’s, I don’t, honest! But, they have given me the most inspiration for photos over the last few years. I set myself a goal too, which was to take a photo of every DIPA that The Numbers brew, although I have done a few others along the way too. Nice and simple shot using a glass desk to create a reflection so you see a double of the bottle. Unfortunately this wasn’t bottled and as such, I have been unable to create a photo for this beer. However, I would love to be able to do so. 55|03, Fifty Five is the Magic Number. We all know that three is the magic number, so three bottles of 55|03 it is. 55|04, Four to the Floor. Originally inspired by the Starsailor song of the same name, I wondered how I could make this into a beer photo. If you are musical you’ll see that the position of the glass and bottles represents the notes on a stave of a disco bass drum pattern. The floorboards play their part too. Hang Five is a surfing term that describes when the surfer moves to the front of the board and hangs all of their toes over the edge of the board. I emulated this by hanging the five bottles over the edge of my table. 55|06, Firing on all six. This is one for the petrolheads and fans of V6 engines. I recreated a V6 engine using bottles and devised a method of support that was not visible in the final photo. 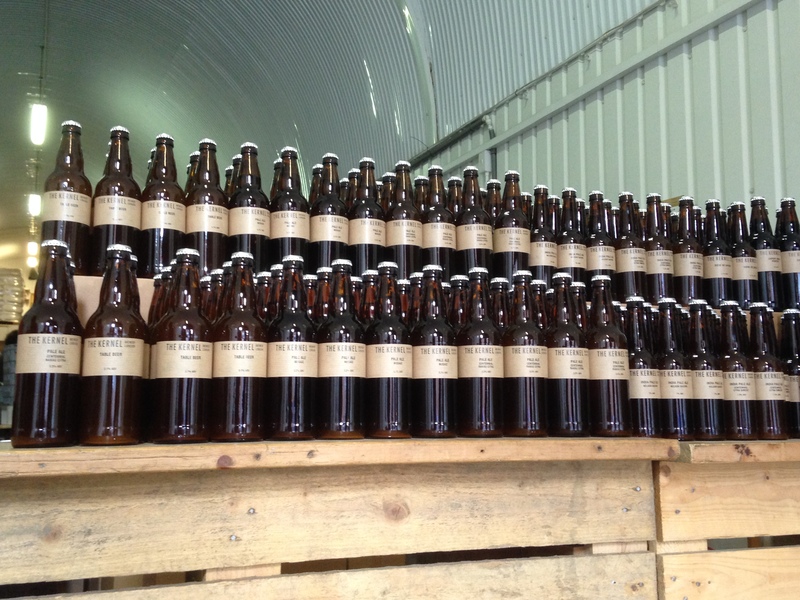 You’ll notice that the number of bottles used in each photo corresponds with the recipe number, this is deliberate and will continue for as long as the DIPAs do. 01|27, Meanwhile, down on the allotment..
Just a few hundred yards from our house is a small collection of allotments, so I put my wellies on, grabbed my trowel and went to photograph some beer. One of the allotment keepers was intrigued by what I was doing, he offered to help too. He told me that the plant in the background was actually Chard, but rather disappointingly, he didn’t have any Fennel. 01|30, Resting on your Lorals. Not being one to rest on my laurels, I will continue to take shots that will make you think a little differently about that beer sat in front of you. But I’m not giving away the secret of this photo. For almost a year both my wife and I had been looking forward to our little Aussie getaway. Laura has always said how much she’d like to live here and that I would too, well maybe, but I’d need to test the water first. Our holiday would be a time to catch up with friends and also a time for me to discover what the Aussies have been brewing. Much like Crete, I didn’t know what I’d be drinking, although I did know that breweries were a little better established here. On our arrival I was greeted by a James Squires One Fifty Lashes. Our journey from Tokyo via Kuala Lumpur was arduous and this fruity pale quenched my desire. That night I got to know this beer pretty well and I hit the sack looking forward to discovering more of what Australia had to offer. But little did I know, this would end up being one of the most reliable beers of the holiday. Rather frustratingly, the quality of the beer I tried varied a lot. I bought beer from a few different shops and many of them were either oxidised or had had something else affect them, probably heat, to the point that they were undrinkable. From one shop in particular, where I picked up two six packs, I probably had two good beers out of the lot. All the beers were well within date too, still having six months plus left to go. Cans seemed to be better, but they weren’t perfect. I bought a four pack of Balter IPA, a cracking little beer with all the pine and citrus you could want from an IPA, with a decent malt base and a solid bitterness too. But, two of the cans were just teetering on the edge, with some unwanted toffee and caramel flavours just beginning to creep in. They didn’t pour as well and from the colour it was obvious that something wasn’t quite right. But, when bought from the right shop, I was absolutely blown away. Beers from Batch Brewing Company were incredible, their West Coast IPA being lifted straight out of the red book. With a delicate touch of grain, this dry, hop lead tropical beast quenches the heat of the day with just a light grab of bitterness to follow. The Zonnebeke India Saison, brewed for Sydney beer week, is a piece of art. It sits below a duck-down head and its crisp, spicy nature will lure out the Saisonator within as you decipher this hugely hopped, IPA, saison hybrid. Overwhelmed by juice at home I’d almost forgotten what it was like to taste a beer with a clawing bitterness. Future Factory IIPA and Sonic Prayer IPA had me, I didn’t have them, they had me, for breakfast. They chewed me up and spat me out, and I went back for more, MORE! I couldn’t get enough, two nights running I prayed sonically. Prayed for more, and it kept on giving. If God was to brew a beer, this would be it. Perfect in every way, heavenly almost, from the divine grain through to the gospel chorus of pine and grapefruit. Saisonism is gonna have to take a pue at the back for a while, this IPA is preaching. But all that preaching can come at a price, beer in Australia isn’t cheap by any stretch. The tax on alcohol is high which can make for some pricy drinking, couple that to the cost of single cans and bottles, and a session on a few different beers can leave a huge dent in your wallet. Some shops do offer discounts on single cans and bottles, but buying in multiples guarantees to keep the cost down. Without any single discount, three individual bottles or cans are roughly the price of a four pack. High strength stuff is mainly in four packs and an individual can such as Modus Operandi Future Factory IIPA is roughly the equivalent to £10. Which is quite a price, but it is 500ml, it is also 8.5% and it is absolutely incredible. It took me straight back to a time when balance and bitterness reigned supreme. Would I live here? That’s a tricky question. I doubt I’d have an issue finding employment as the demand for skilled tradesmen is high. But it’s bloody hot, too hot sometimes and I like a nice crisp winter. Parts for my 2cv would be virtually impossible to get quickly, and no, I wouldn’t have any other car in case you were wondering, wouldn’t even entertain the thought. It’s that satisfying feeling of vigour you get from driving a 2cv with the roof off on a fresh, crisp winters day which is just unparalleled. Actually, just the feeling you get from driving a 2cv anywhere is unparalleled. Welcome to my first ever Golden Pints. You’ll find that it doesn’t conform to the same formula as everybody else’s. Why should it? This has been my year in beer, and for that reason alone I’m writing this my way and not to a prescribed formula. Marble Brewery, Portent of Usher. It’s difficult to explain exactly what this beer did to me when I drank it. But I wished it would never end, it’s sumptuous, heavenly, warming and probably one of the best beers I’ve had this year. Hazy, fruity, gloriously full in the mouth. Difficult to believe that it’s actually a cask beer. The body and life of the thing are truly fantastic, definitely should be one of your five a day. You really don’t need anything else in a can, but this. Fact. It’s pretty damn near perfect, in every way. Coupled to the way it just appeared, with no fuss. Bang, here’s our first Double IPA. Thank you very much. The rest of you can stay at home. V6 all the way, that aroma is just incredible. So good in fact, that I’d quite happily have it as an air freshener. The order of the rest? Oh just put the remaining version numbers into ERNIE and see what comes out. Best use of beer tiles. So many people have used beer tiles this year, it’s been a tricky one to conclude. Do you go for consistency or variety? Here’s some of my favourites of this year. But I think the overall winner has to be this from Matt The List. Tom Denham has taken some spectacular shots this year. Lighting and depth of field have been pretty near perfect in most of his shots, the subjects haven’t been too sloppy either. Think he and I need a bit of a photo competition. What do you mean one? Really? Not saying, but here’s a link to the AA should you ever need it. Has to be Adrian Tierney-Jones. I’ve not kept up with a lot blogs as much as I should have done this year, and neither have I kept up with my own for that matter. But I always manage to find time to read Adrians. It’s pure beer poetry, no matter what he writes. One could say it’s poetry in mash tun. Becoming an ambassador for St Austell’s Proper Job. Sharing my love of this glorious beer with other like minded people and informing others of its presence has been great fun. I’ve met some fantastic people over the last twelve months through being an ambassador, and I’m looking forward to 2017 and plenty more Proper Job. Because as they say, it’s always Proper Job o’clock! 2015, my year in beer. Part one. For me, 2015 started like pretty much every year before it, on January the 1st. 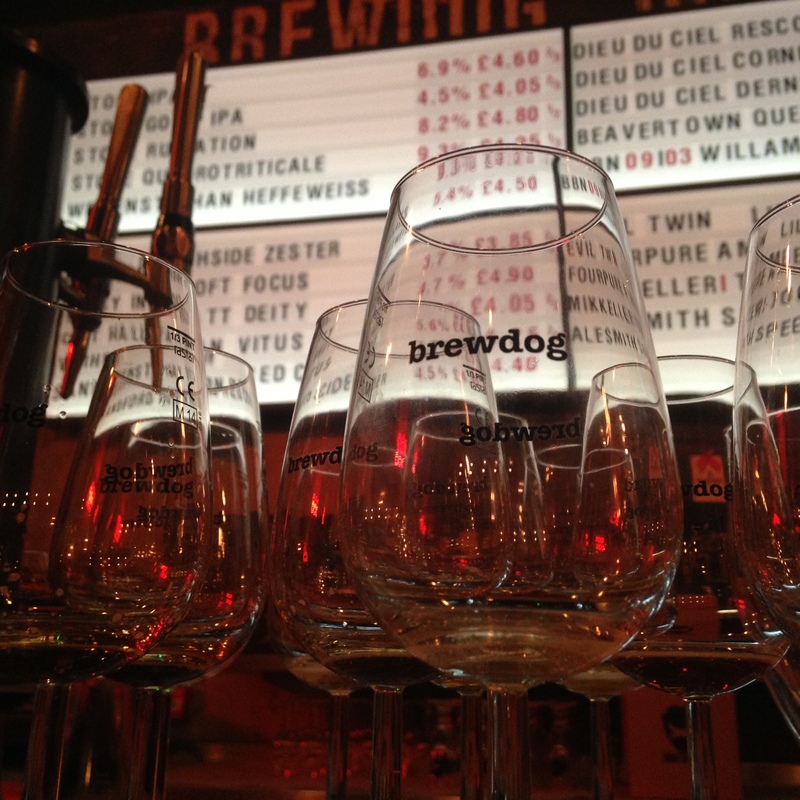 However, this year we were in Cardiff with friends and I was warming up for the New Year and also a visit to a Brewdog bar, funnily enough the one in Cardiff. As you’ll know this was to be my first visit to one of their establishments and I was like a child on Christmas Eve who could not sleep with excitement. When we arrived, I was not disappointed either. The whole experience was thoroughly enjoyable and it was a pleasure to go there and sample the beer. The staff were also fantastic. 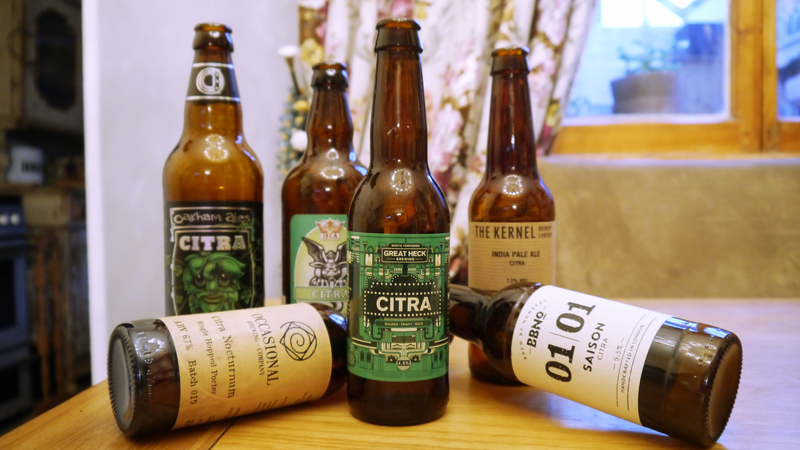 Following my visit I put hand to keyboard and wrote Hoppy Craftmas, which just ended up as another entry in my blog, which at the time I felt wasn’t really getting the response I would have liked. Now I realised that I couldn’t expect the world to drop everything and home in on my blog overnight, after all I had only been compiling it for a few months, but I felt that I had to improve things and I really wanted them to too. In steps Twitter. After the visit to Brewdog, we were out and having a few drinks with some friends and the subject of my blog was mentioned. I happened to be the only person in the room who didn’t have a Twitter account, I wasn’t that bothered about this to be honest, as I didn’t see what the fuss was about! 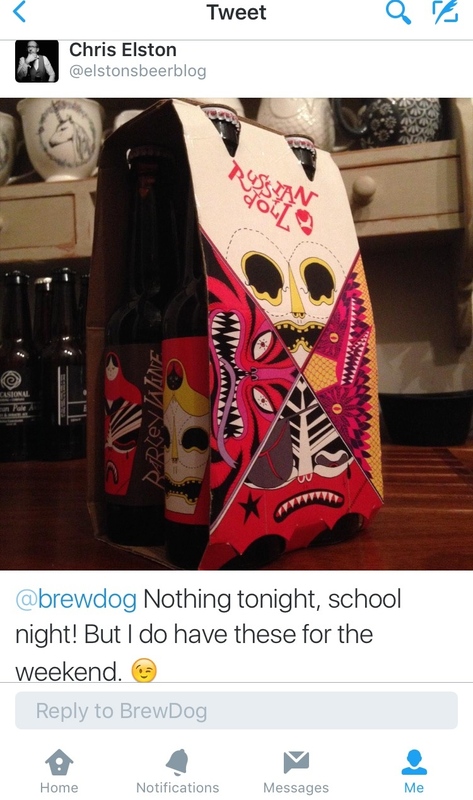 So, right then, my wife tweeted Brewdog and shared my blog post with them. She received a reply almost instantly and I couldn’t believe it! Somebody, who I’ve mentioned in my blog, is actually reading it! Right there and then I logged on to Twitter and set up an account. But who to follow? I knew plenty of breweries and other beery stuff but where do you start? The remainder of my evening and the journey home was spent with phone in hand trawling through the apparently endless list of breweries on Twitter. This was fantastic, and I followed everybody who sprung to mind. Later in January, my wife and I were due to go to London for her birthday, and I, being the caring husband that I am, thought I’d leave her for a few hours and go and do some drinking. I, like so many other people, went to Bermondsey and cruised the beer mile, on foot. On the way over I thought, right, don’t drink too much, you have to write something afterwards. And write something I did, and on arrival at The Kernel, with trusty phone in one hand and a beer in the other, I set about making a few notes of what I was going through. What I came up with was Bermondsey Arches Breweries. However, two or three beers down, I ventured back to the bar and thought I’d take their Saison. Not really knowing much about the style and having never tried one before, I ordered. Wow! Initially I didn’t know what to make of it, that flavour was so intense and sharp, and like none of the pales that preceded it, I almost poured it away! I really wasn’t sure about it to be honest, which is why I didn’t include it in my piece about the visit. Looking back, I find it strange though, because I absolutely love a Saison now and if it wasn’t for this first taste that opened my eyes to the style, I would probably never have tried more. Back home and sat on Twitter, again, I discovered Goodbeertweets and Imdrinkingnow, great pages who people tweet and share the beer they’re drinking, fantastic idea. It was through this that got me tweeting more about the beer that I was drinking, and sharing it in the process without having to give any of it away either! Genius! 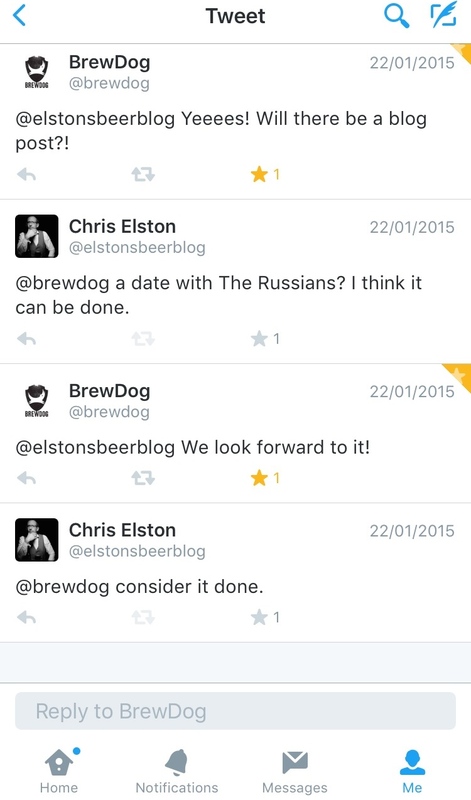 Brewdog were also tweeting about what people were drinking, and I tweeted them a picture of their Russian Doll set that I had bought a few weeks earlier. The reply I received was totally unexpected. Originally I hadn’t intended on writing anything about these beers, but seeing as they’d asked, I will!! And yes, my wife was in Berlin that weekend, and my Date with the Russians was on. But I still don’t really know where the inspiration behind the idea came from! The post just happened, and it ended up requiring hardly any editing! Following this, I didn’t know what to write about. 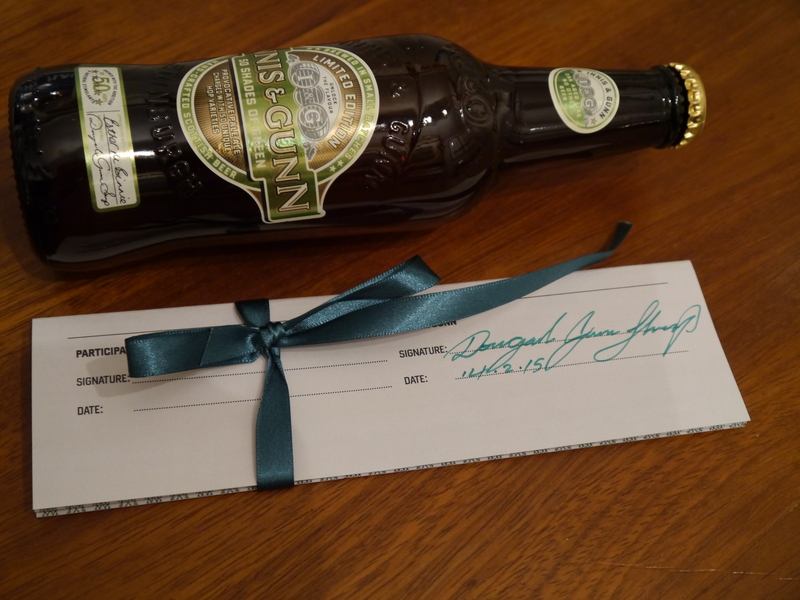 And then I saw that Innis & Gunn were about to release a beer that coincided with the film Fifty Shades of Grey. The beer was to be called 50 Shades of Green. I have to admit now that I’m a sucker for something that would appear to be a little rare or slightly different, so I opened my wallet and bought a bottle. I’m not going to repeat the price, but those who know, know. I was expecting to be blown away by this beer, but unfortunately I wasn’t, and I really craved something that I could get my teeth into. We had a trip to Budapest booked with the same friends we spent New Year with and I couldn’t wait. On the days leading up to the holiday we researched places to go, namely beer places, but some nice restaurants too. 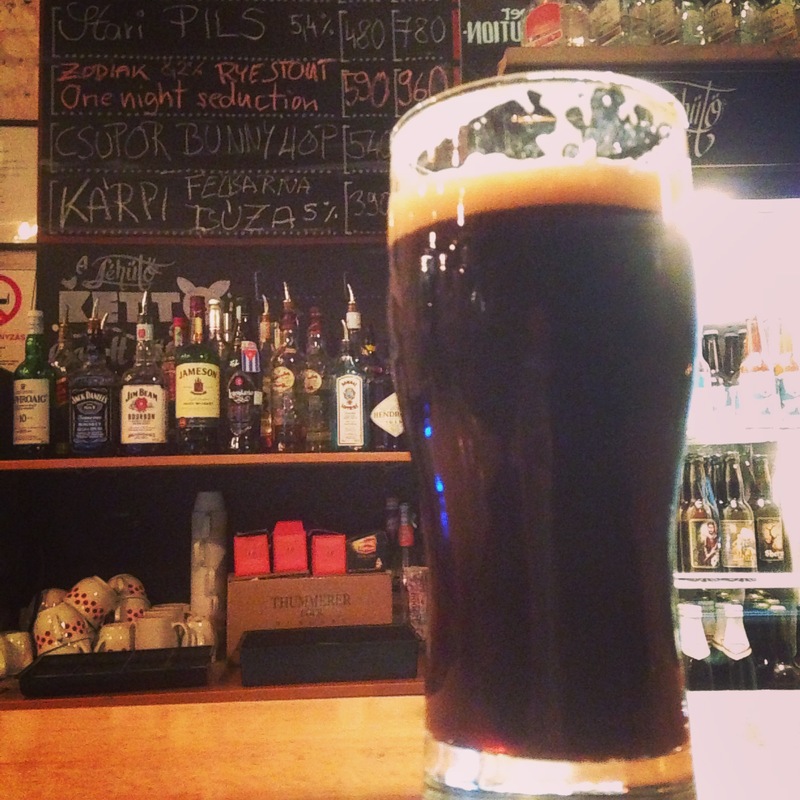 I had no idea that there was any sort of craft scene in Budapest, but as it happens, there is. The beers I tasted here were amazing, and I felt right at home in Léhütös, The events of our trip also spawned my next post, Budapest? But I don’t even like George Ezra! Which, done from memory was rather tricky, yet yielded a result that I was happy with. But looking back, I knew I should have taken notes as we went. After this, I went in search of my next topic, so bring on Citra Session. Citra containing beers are everywhere, but what I was interested in was the single hop varieties that would allow the hop to be itself. I collected what I thought were six, single hop Citra beers, only to find that one of them was only dry hopped with Citra and contained other hops in the brewing process. 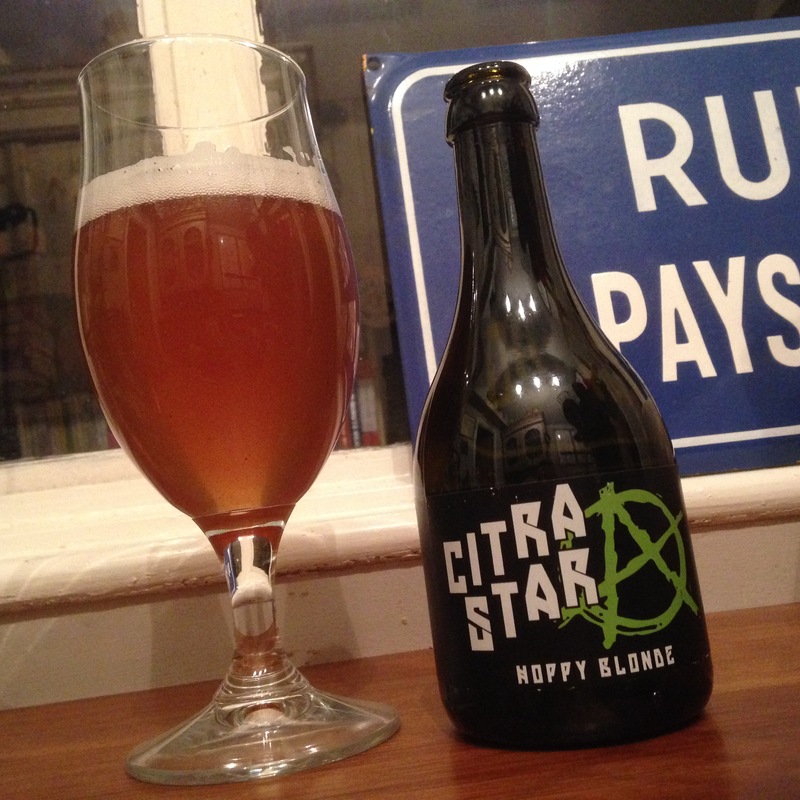 I was massively disappointed with this as Citra Star by Anarchy Brew is a fantastic little beer which offered so much flavour! It was a shame that I couldn’t include it. This piece took over two months to put together and to this day has been my most viewed entry, with nearly five hundred views to date. I felt like a minor celebrity in the days after posting; the number of favourites and retweets just kept on growing! And a few people I spoke to were amazed I received a response from The Kernel, as they tend to shy away from social media. But the response I got was fantastic, and I am so grateful to them and the other contributors alike. But now I was really stuck. Where on earth do I take my blog after this? I felt mentally exhausted and was completely clueless about what subject to do next!